I believe in functional fitness. Moving and lifting in a way that will make everyday life easier. Always challenging your body and mind to the next level. Working with body weight, weights and cardio. I believe that people need to get away from how they want to look and focus on how they want to feel. To not feel weak, to not feel out of breath when going up stairs. Not everyone is going to look like the people in the magazines, focus on your health and well being. I believe in functional fitness, squats, lifts, presses, pull ups (yes everyone can do a pull up) switching things up making fitness fun and. Not the same old thing every day. Nutrition and cardio are number one when it comes to fat loss, so keeping track of how you eat and understand why you should eat that way. And learning how to make healthier options taste wonderful. I love to teach people how to become healthier for themselves and their family. I was the fat kid growing up. I had bad nutrition and no good remodels for a healthy lifestyle. Every health risk runs in my family, when I got pregnant I did not want the same thing for my daughter. I decided to change my health for both of us. I started out blindly reading books and magazines, getting confused and not knowing if what air was doing was right. After my daughter was born it took me over a year to lose the weight. I have struggled with eating and still to this day deal with food cravings. I am human. I lost my baby weight by being more strict on my sweets and running. People started asking how I did it and to help them, so I decided that it was time to become educated and help others. So that is what I am here to do. I went to school and learned all about personal training, then in my internship learned about crossfit and fell in love. 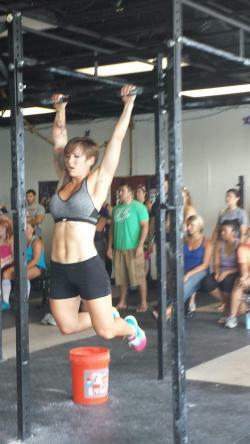 My passion is crossfit and how functional fitness works for everyone. I have been personal training for 4 years now and I love it everyday. I love my job, I love to help my clients become healthier and start believing in themselves. The greatest reward is to see my clients accomplish their goals and make new ones.